The performance of a buried pipe is affected by various external factors related to the pipe properties, the buried environment, and internal and external loads. Each of the factors has a different degree of influence on the pipe. 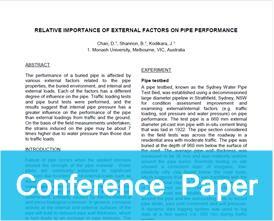 Traffic loading tests and pipe burst tests were performed, and the results suggest that internal pipe pressure has a greater influence on the performance of the pipe than external loadings from traffic and the ground. On the basis of the field measurements undertaken, the strains induced on the pipe may be about 7 times higher due to water pressure than those due to traffic loads.